This a perfect place for families. The set up works very well to accommodate fun with everyone in the same space. Everything looks just like the pictures. The location is beautiful and definitely worth enjoying. Every question was answered right away. Everything was very easy to access and clear instructions were left for all else. Our family made some great memories here. We thoroughly enjoyed the home and its closeness to Powder Mountain. We didnt realize when we booked it how close it was to Pow Mow, nor how much we would love skiing pow mow! That turned out to be the greatest attribute. The house was clean and well stocked with everything we needed to make meals for 3 families with teens at home. We had a great time. The only small negative was the size of the family room. Small and not enough seating for us all to be together, but we made it work and thankfully we are all great friends so were comfortable being so close! Bedrooms were huge and very comfortable! Would totally recommend to other families and would come again. Beautiful Place in a Great Location! The place was nice and clean. Close to Pineview which we enjoyed for 2 days. We would definitely stay again. Our group of 8 (two families) stayed here for five nights. 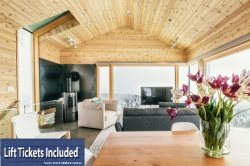 The property is in a fantastic location for those who are skiing at Snowbasin or Powder. It is a newer property with very nice finishes (granite, tile floors, berber carpet) and fixtures, and the property was immaculate. The kitchen was nicely equipped and had everything we needed (we cooked full meals). The four bedrooms are upstairs, with each half of the upstairs set up with two bedrooms sharing a Jack and Jill style bath ---this was nice for us as each family had their own side of the upstairs with their own bath. The downstairs living space is a little tight for a large group, but it was manageable for us. One thing to be aware of is that there are a lot of steps -- this is just something to be aware of if that would be an issue. There are a few steps to get up to the main door of the building, then more steps to get upstairs to the door of the unit, then more steps to access the bedrooms. I want to give a shout out to the management company, who provides really excellent customer service. I had asked in advance about getting an air mattress for one of the bedrooms, and for a small fee, they provided a foam mattress and complete linen setup for that -- it was waiting in the unit when we arrived just as promised. On the first day, we couldnt find out how to get into the storage area for ski equipment -- I emailed them to ask, and within 15 minutes, they had delivered a key. I had one other question while i was there, and the email response was almost immediate. Definitely consider this property for your ski vacation --- we would certainly stay here again. We stayed here for a large family reunion and loved it! It was way roomier than we expected and everything was in excellent condition. Not a single complaint. Well definitely keep it in mind for the future.